Automating emails works best when welcoming new subscribers, verifying transactions, reminding consumers about items in their shopping cart, or confirming event registration. Avoid automating emails that require an immediate response, like customer service questions or messages from an unmonitored account. The days of “batch and blast” email sends are over. To be effective at modern email marketing, you need to send the right message, to the right person, at the right time. Since marketers aren’t in the business of mind reading, they need to invest in email marketing automation software to succeed. The majority of marketers believe investing in email automation software is worthwhile. About 74% say automating emails saves time, improves customer engagement (68%), leads to more timely communication (58%), and/or increases upselling (58%). We explain when using email automation increases your bottom line, and when good, old-fashioned manual emails are still the right way to go. What Emails Should Be Automated? Automate emails to welcome new subscribers, remind prospective customers about abandoned items in their shopping cart, confirm webinar registration and remind participants before the event, and verify payment transactions. Automation is a must when someone signs up for a mailing list. Think about it. If you browse a blog or website and decide to opt in to hear more about the company or get promotions, it’s not a great user experience if there are crickets on the company’s end after you hit submit. Promote your best content and special offers. Consider welcome emails as an opportunity to make a strong first impression on a new subscriber. Make them feel welcome immediately. 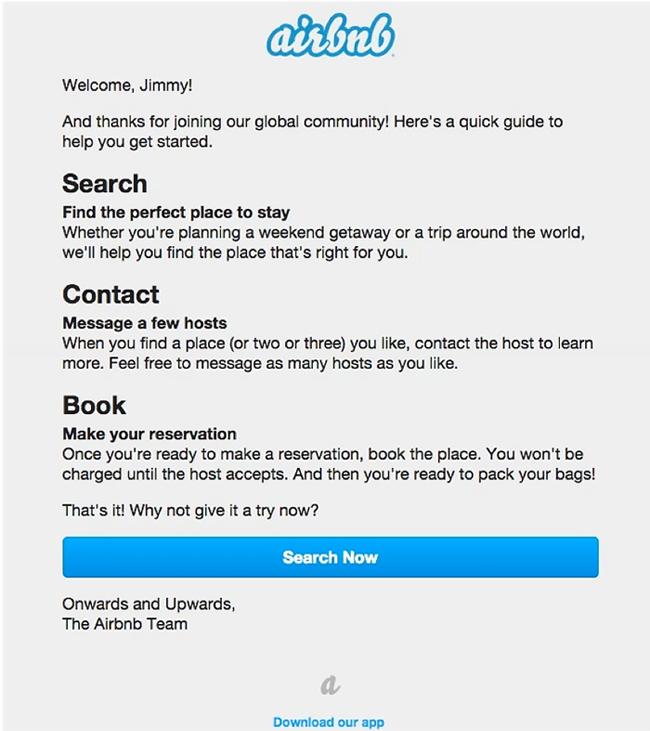 Airbnb has an effective welcome email that thanks new subscribers and then walks them through how to use its platform. The email summarizes what subscribers can expect after signing up and communicates what type of messages they’ll receive in the future. An automated cart abandonment email reels in customers who are considering making a purchase – moved an item to their cart – but have not followed through yet. Nearly 60% of online consumers abandon a site after three seconds, and 80% of those consumers never return. Behavioral marketing company SalesCycle reports that every cart abandonment email sent delivers more than $8 in revenue, and nearly half (44%) of all cart abandonment emails are opened. 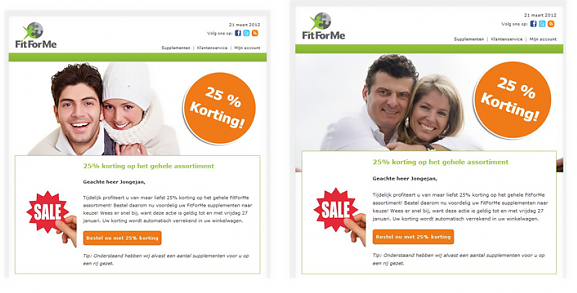 So, cart abandonment emails clearly increase revenue, but why do they need to be automated? Put simply, a cart abandonment email strategy is impossible to execute manually. Automating cart abandonment emails also ensures timeliness. It wouldn’t be effective to spend hours sorting through which customers wanted what items before manually sending an email. 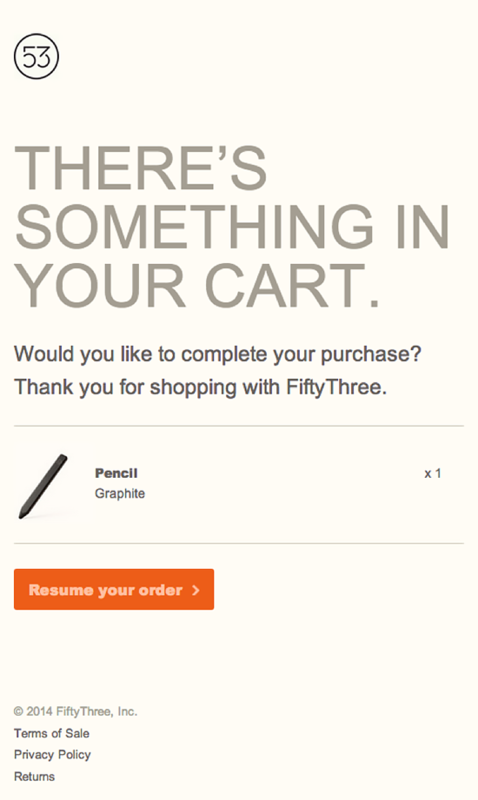 Check out a typical cart abandonment email from Fifty Three, a technology company that specializes in tools for mobile creation and visual thinking. The message is clear and concise. You made a move to purchase a graphite pencil but then left the site. Do you want to complete your purchase? Someone signed up for a webinar: mission accomplished. Well, not just yet. Getting them to register for the webinar is one thing, but ensuring they actually attend is another. The average registration to attendance rate for webinars is around 40%, so it’s necessary to send automated webinar email reminders to encourage attendance. Webinars are the second most effective way to generate leads. 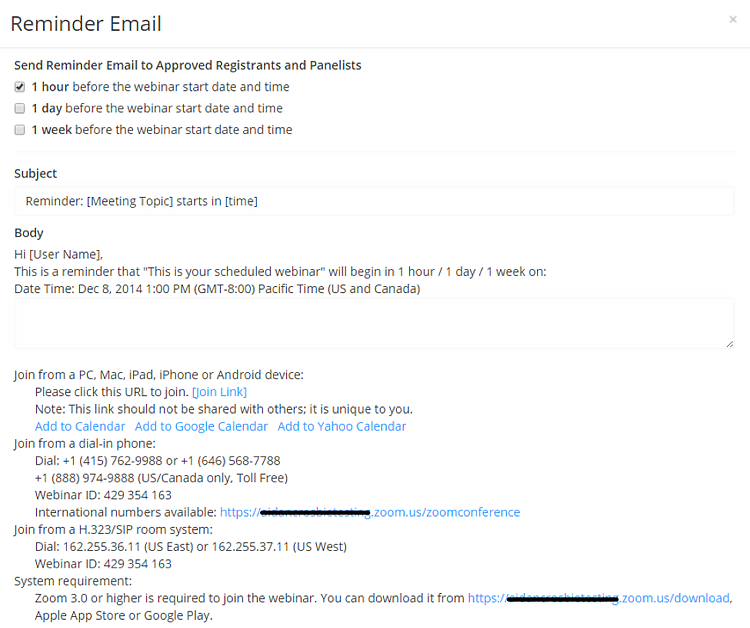 So, when and how often should you send automated webinar reminders? We recommend sending reminder emails three times before the webinar begins. First, send an automated confirmation email after a person signs up. Then, send an automated reminder one day out. Finally, an hour before the webinar begins, send a final follow-up email. Most webinar platforms have these capabilities built in, so there is little effort required to schedule these confirmation and reminder emails. After making an online purchase, customers expect a confirmation email – otherwise, they may suspect something went wrong. Therefore, when your customers open their wallets, reassure them with an automated email that confirms that a transaction occurred successfully. Remember, just because an email is transactional does not mean it needs to be boring. It’s another opportunity for you to highlight your brand and create a helpful point of interaction with your customers. 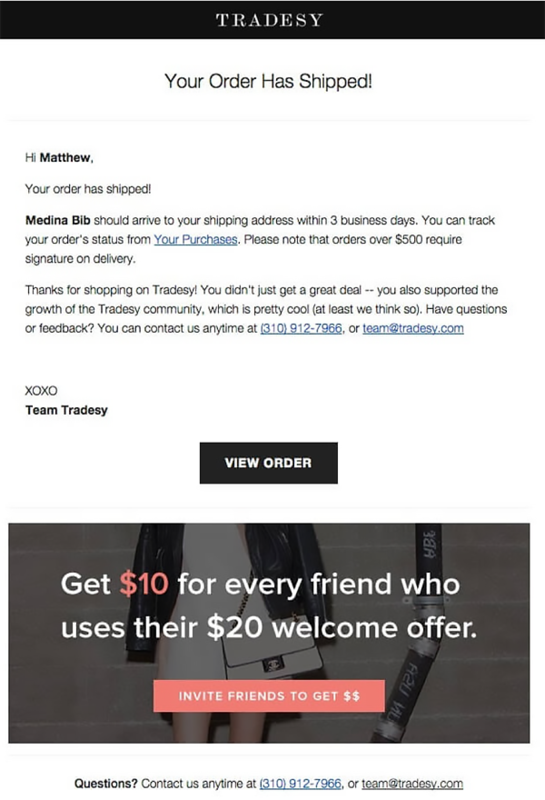 Tradesy, an e-commerce platform for designer bags, shoes, and clothes, incorporates thoughtful design, dynamic content, and a refer-a-friend incentive. Other emails that perform well when automated include unsubscribe emails, upsell emails based on past purchases, and milestone emails, such as birthday campaigns or reengagement emails. What Emails Should NOT Be Automated? Avoid automating emails to reply to customer service requests, promote limited-time deals, invite people to attend a webinar, and/or distribute messages from an unmonitored email address. Use automated customer service emails sparingly. It’s appropriate to automate an email that confirms when your company receives a customer support request. However, remember that customer support contact information implies a human element. Ensure you have a human representative on the other end of your support address to vet and answer customers’ question. One of the quickest ways to lose customers’ trust is to send a robotic, unhelpful message when they are in need of assistance. Automate one-time-only promotional emails, but personalize repeated promotional messages based on your audience’s characteristics and behaviors. First, segment your emails based on subscriber preferences and behavior, such as when they open emails, what products interest them, and their age and/or gender. 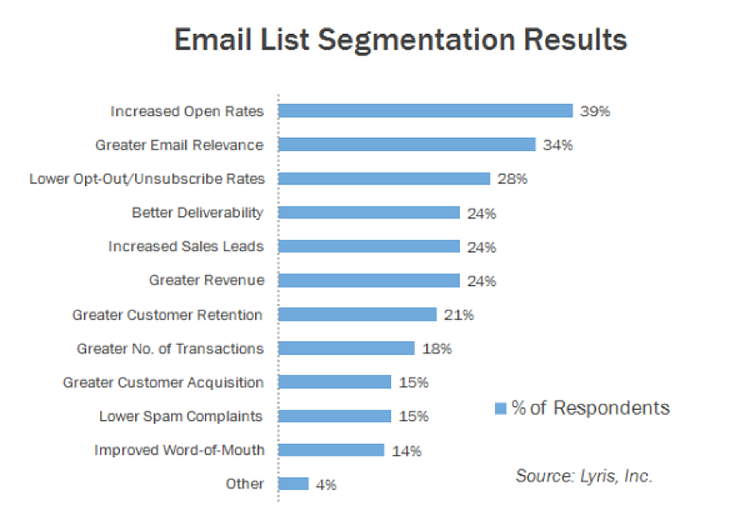 A study from email marketing firm Lyris found that marketers who segment their email lists based on subscriber preferences experience more success, like higher open rates and lower unsubscribe rates. Marketers can segment audiences in various complex ways, but beginners should not overcomplicate the initial segmenting strategy. First, start with the basics. Save general demographic information, like age and gender, from the moment people opt-in to receive your emails. After segmenting your list based on these characteristics, personalize your messaging to address each segment directly. In the example above, women's fitness center Fit for Me offered a promotion but knew its audience varied in age. Instead of creating separate campaigns for each age group, they simply switched out the image at the top of the email and kept everything else the same. This simple switch allowed the image to resonate with the different age groups that make up their email list. Second, if you send a series of promotional emails, you can adjust distribution tactics based on subscriber behavior, like who opens the email and what links they click. For example, if a subscriber does not open your first email, send the same email the next day but with a different subject line. Similarly, if a subscriber took advantage of the promotion on the first day, do not send them another email. Sending them the offer again is repetitive and annoying. The extra work required for real-time segmentation means manually sending these types of emails are your best bet. Avoid automating emails that invite people to participate in a webinar. Real-time segmentation is important when sending out a series of invites. If someone registers for your webinar after receiving the first invite, you need to exclude her from later emails to avoid losing her trust. More sophisticated email service providers can communicate with your webinar platform and allow you to automate emails. However, it might be more work to set up an automated workflow with all the proper rules and triggers to segment out those that already registered than to just do so manually. When sending email campaigns, it’s critical to use an email address that is monitored. Avoid generic addresses like [email protected]. Even if the text of your email urges subscribers not to reply, people still reply directly, and their questions, comments, and feedback go unanswered. The rules for replying to inquiries are the same as for responding to customer support requests. Make sure there is a real person on hand to talk to a prospective or current customer. Email marketing and marketing automation software makes it possible for marketers to automate most email campaigns. But, there always will be emails that should be sent manually. When capturing new contact information on your website, it’s critical to funnel prospective customers into automated, lead-nurturing workflows. However, as you plan monthly email promotions, consider manually distributing emails to ensure different messages go to different segments of your list based on their online preferences and behavior. Mallory Mongeon, hailing from Minnesota, is an avid email marketer. She currently serves as the Email Marketing Manager at Fruition, a full-service enterprise digital marketing agency, where she defines and drives the strategy for email marketing campaigns in both B2C and B2B environments. When she isn’t at work, you can find her enjoying a craft beer or hanging out with her Dachshund named Schnapps. Compare email marketing agencies and read detailed client reviews to find the best fit your business. Learn strategies for targeting & segmenting, attracting subscribers, and tracking email marketing results.